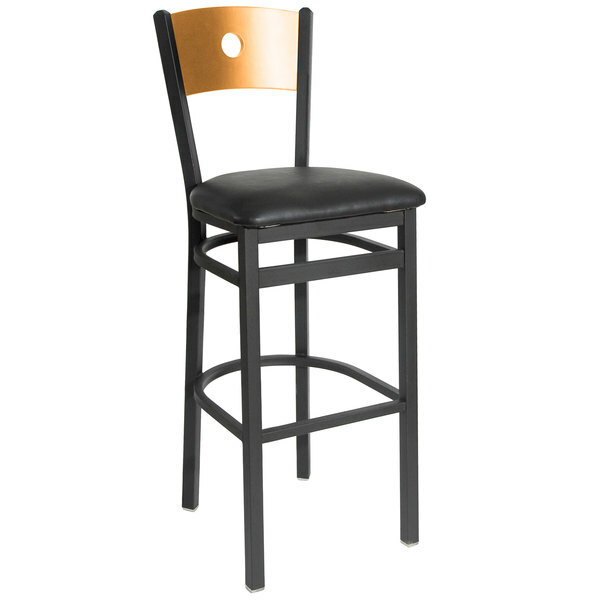 Instantly upgrade your contemporary dining area with this BFM Seating 2152BBLV-NTSB Darby sand black metal bar height chair with natural wooden back and 2" black vinyl seat! Not only does it feature a cushioned, vinyl seat for unmatched comfort, it also has a wooden backrest with a cut-circle design that is sure to add a simple yet modern touch to your restaurant, bistro, cafe, or catered event. Plus, the backrest has a professional, natural finish that complements the black vinyl perfectly. Constructed with a sand black metal frame, this bar height chair boasts a convenient footrest to reduce the pressure on customers' legs and lower backs and promote optimum relaxation. Its straight legs are connected with a support for additional stability and are capped with plastic glides to protect floors from scuff marks. The glides are also designed to slide smoothly and quietly, helping keep unwanted noise to a minimum. 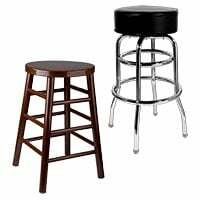 Add this sturdy, stylish chair to your indoor bar or high table tops and ensure guests can comfortably enjoy your signature drinks, appetizers, entrees, and desserts!